On 30 December, 2017, the Bhima Koregaon Gram Panchayat wrote a letter to its taluka police station in Shikrapur. Tension had gripped the village of Vadhu, four kilometres from Bhima Koregaon, over a historical dispute regarding Shivaji's son, Sambhaji. "To avoid a law and order situation, the gram panchayat and the entire village has decided to observe a bandh on 1 January, 2018," read the letter addressed to the police inspector. "We request you to take the appropriate decision and cooperate with us," it added. However, the letter was written on 31 December. And as it turned out, the village had not been consulted before arriving at that decision. The testimony of the clerk who typed and signed the letter has intensified many doubts about the Bhima Koregaon riots being a pre-planned conspiracy by certain groups. In his affidavit to the inquiry commission investigating the Bhima Koregaon riots, Sagar Gawhane, the clerk, has said he typed the letter because Ganesh Phadtare, a Maratha leader and former deputy sarpanch of Bhima Koregaon, asked him to do so. 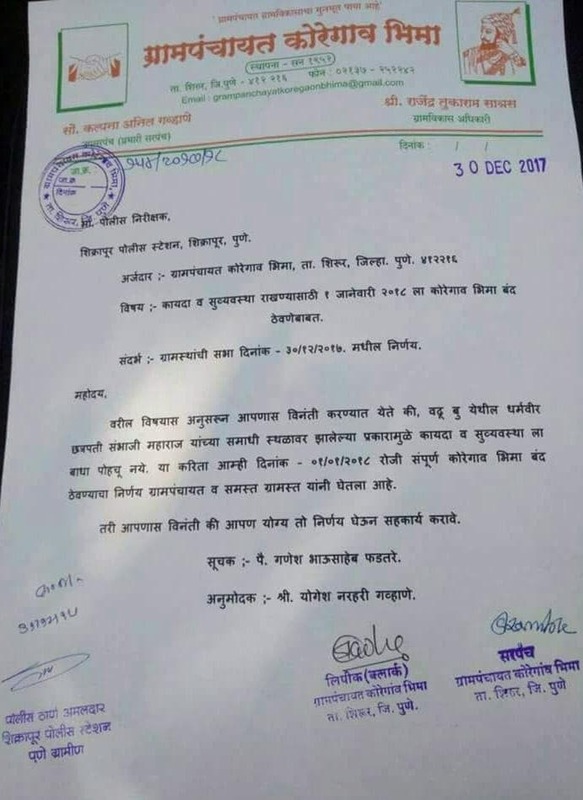 "On the morning of 31 December, Phadtare called and asked me to come to the gram panchayat office urgently," the affidavit reads, "When I reached the office, Phadtare and his karyakartas were already there. He asked me to type a letter that called for a bandh in the village." Upon a bit of resistance by Sagar, Phadtare called Village Development Officer Rajendra Satras. Satras told Sagar to "do what Phadtare said". He typed the letter with Phadtare named as the initiator, and Yogesh Gawhane as the endorser. Yogesh, however, was not in the village at the time. When Sagar pointed it out to Phadtare, he said, "It is none of your business." Phadtare further asked him to backdate the letter because 31 December was a Sunday. "The gram panchayat and the villagers had taken no such decision to shut the village, as we claimed in the letter," Sagar's afiidavit reads, "The gram panchayat's proceeding book also has no note of it." Another resident of Bhima Koregaon, Mangal Kamble, in her affidavit, has said she had no clue about the bandh, corroborating Sagar's claim of no unilateral decision or meeting with villagers to keep the village shut due to frictions in Vadhu. The village of Vadhu has a Sambhaji memorial. Credible historical accounts suggest that Sambhaji was cremated by a Dalit man called Govind Gaikwad after Aurangzeb killed him. On 29 December, Gaikwad’s statue, which stands right across Sambhaji’s memorial, was vandalised, triggering caste animosities. 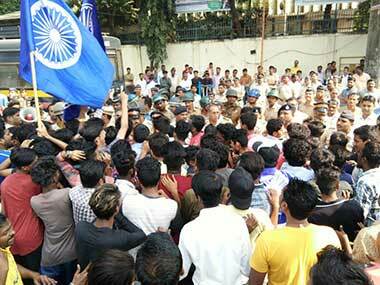 The Pune rural police had taken cognisance of the developments. "The call to observe a bandh in Bhima Koregaon to avoid a law and order situation was odd, when Vadhu itself had not called for a bandh on 1 January," said Rahul Dambale, activist with the Republican Morcha, based in Pune. Every year, on 1 January, tens of thousands of Dalits across Maharashtra gather at the war memorial of Bhima Koregaon — 40 kilometres from Pune. It commemorates the historic victory of the British army, which had a significant Dalit contingent, over the Peshwas. This year, it was the 200th anniversary of the battle. Therefore, it was an even larger crowd that was allegedly assaulted by right-wing groups. To observe a bandh, and have the shops and eateries in the village shut would have caused inconvenience to the pilgrims who travelled to mark the bicentenary. Victims of the riots claim that was the precise idea of the bandh was to cause inconvenience if Dalits obeyed, or, more likely, wreck havoc if they resisted. Victims have consistently asked how so many stones turned up in the area to be pelted at the gathering? Mangal's testimony explains how her eatery was burnt because she made arrangements of tea, snacks and lunch for those who had travelled to be part of the gathering. "On 31 December, 2017, my son Ram was decorating the premises in front of our shop. At 11.30 pm, member of gram sabha, Ganesh Phadtare arrived with two others," she has written, "They said we have called for a bandh. Take down the decorations you have put up to welcome 'your people' and keep your shop closed tomorrow. My son declined to obey the orders and continued to work. Phadtare abused and threatened us that night. The next morning, when the visitors were having tea and snacks, a mob of 20 barged in and started beating us up, in which I was severely injured. My guests were forced to leave. The shop and the mandap we had installed were also vandalised. I was taken to a hospital in Hadapsar for primary treatment. On 2 January, when I came back to pay the person who had made decoration arrangements, a mob of 2,000 vandalised and burnt our house and shop at 11 am. We incurred losses of around Rs five lakh." The Pune rural police has arrested 110 people so far. One of them was Phadtare. But because of the prolonged investigation, and the failure of the police to file the charge sheet nine months since the riots, most of the 110 arrested are out on bail. Including Phadtare.